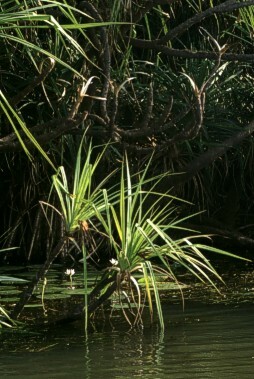 This little Pandanus jungle grows on the banks of Yellow Waters. It may look slightly dryer on other places they grow, but not much - they received their name for good reasons. And imagine: the picture was taken at about the lowest level of dry time. A couple of weeks later these green leaves will be submerged under some metres of water. There is another species of Pandanus in the area, Pandanus spiralis, but not on such wet places.